Our contemporary obsession with speed has claimed control over every aspect of human life; a staggering number of men and women rush to get as much done as possible, consuming crazy amounts of caffeine and gorging fast food so they don't waste much time on their most natural of needs. The consequence is a whole civilization suffering from ADD. The time that bred a generation of metalheads who listen to several releases from different bands per day also gave birth to bands who allow you to listen to several genres at once, such as these Estonian youngsters. Flights Of Fancy is an almost entirely instrumental, 80-minute long release which entertained me greatly. 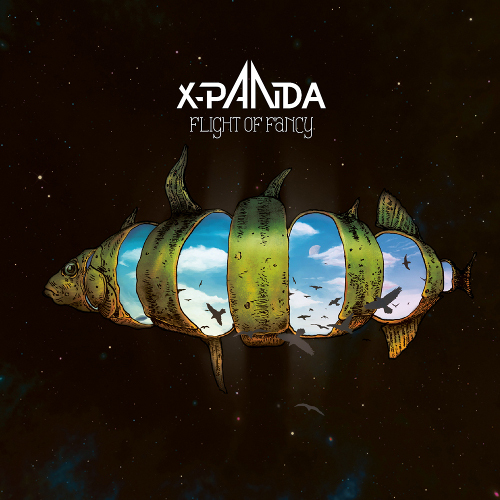 X-Panda claims being "proudly influenced" by Porcupine Tree, Planet X and several guitar/piano virtuosos, but the metal/prog influence is just one of the elements being dominant here - the other two are jazz and symphonic music present in movie soundtracks. The symphonic elements are sometimes too obviously synthy, but this band's imagery is very youthful and exuberant, so a bit of cheese is actually an accessory contributing to their music. The band also treats us to various "sound effects" entering their cheerful, flowing guitar/keyboard melodies - Nightwish-esque choirs, punk-ish shouts, fiesta trumpets, electronic sounds and many more. When vocals make an appearance, they steal the show - imagine a deep voice, as sombre as Daniel Gildenlöw in his most theatric of moods, interpreting ridiculously catchy melodies. While singing along to them, you'll sound like an occultist on Prozac - extra points if your absent-minded humming disturbs strangers standing next to you! X-Panda's goal is to play music for dreamers and our inner children. Indeed, their music brought up a very personal memory of mine. An art teacher in my elementary school used to play us some very light jazz fusion (the calm sections of the album reminded me of it) to inspire the class as we made sketches. I've learned to like the music, but my repulsive drawings made me decide to turn away from that brand of art, which ultimately lead me to creative writing. So, yeah, try Flights Of Fancy, it digs up stuff from your subconscious! And speaking of art, how awesome is that cover anyway? A part of the team since December 2011, writes about the progressive, the sad and the melodic. 7.0 means the album is good. Well, this sounds remarkably intriguing. Nice review! It is, it is the most fun I've had with an album for months. Sure, it's long, but it totally pays off. Porcupine Tree? I'd say this is for me. Symphonic elements with prog/jazz... i shud check this out for sure. You can watch their video for the song Revelation here. X-Panda rules! I love the fact that they are from my home country. But I don't understand why the reviewer didn't mention their most prominent influence - Dream Theater. Totally just hit me that the band name is a play on "Expander"
Ha, no I'm sure it doesn't mean anything, I was just praising myself for noticing such a simple pun. Perhaps it could be a reference to band's style "expanding" in different directions, or the lengthy nature of the record. Or maybe they couldn't think of a good name and chose X-Panda for purely random reasons. I'll ask them via email and report my finds on this thread. "Revelation" is the song that won me over. These guys might actually be the best new band from Estonia since... forever. This one is absolutely right up my alley. I shall check them out asap. No I think it has more to do with crossbreeding people and panda bears. Or, you know, it's Monty Python style. "This panda is no more. This is an X-Panda." And so on. On the topic, though. X-Panda is indeed excellent stuff. Definitely one of the better albums this year. And I'm not just saying because they are from Estonia and play prog/fusion. Although, both help. The only thing they could have done better is use more vocals. The instrumentals are good by themselves, but with vocals this stuff sounds even better. Oh, and excellent review, Mora! Keep it coming. Well I plan a couple of guest reviews... but this front page business is fun, way more feedback I hope I'll get the opportunity to do more of it! All this talk about the music and band name and no mention of this awesome cover art. Well, no mention of it aside from the end of your review. Oh yes, the awesomeness that is this cover. I love the concept. Open a fish, reveal a sky. With birds. That eat fish. With SPACE as a background. Space as a PLATTER. God, that would be the most awesome restaurant ever. And thanks Troy for posting a larger version of the cover. That is damn amazing/trippy/clever/wonderful. Members of X-Panda thank you all very muchfor your kind words! Great album and awesome review. Thanks for leading me to this!